Initially, bond completion companies would not insure Downey for roles in feature films. Mel Gibson, who had been a close friend to Downey since both had co-starred in Air America, paid the insurance bond for the 2003 film The Singing Detective. Downey's performance in that film paved the way for his return to feature films including a role in the black comedy crime Kiss Kiss Bang Bang (2005), the mystery thriller Zodiac (2007), and the satirical action comedy Tropic Thunder (2008); for the latter he was nominated for an Academy Award for Best Supporting Actor. 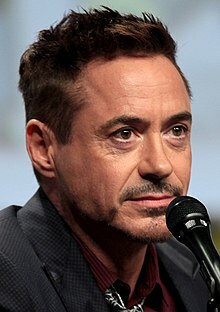 In 2008 Downey began portraying the role of Marvel Comics superhero Iron Man in the Marvel Cinematic Universe, appearing in several films as either the lead role, member of an ensemble cast, or in a cameo. Each of these films, with the exception of The Incredible Hulk, has grossed over $500 million at the box office worldwide; four of these—The Avengers, Avengers: Age of Ultron, Iron Man 3 and Captain America: Civil War—earned over $1 billion, while Avengers: Infinity War earned over $2 billion. 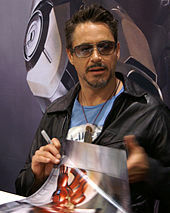 In 2012, Downey reprised the role of Tony Stark in The Avengers. The film received positive reviews and was highly successful at the box office, becoming the third highest-grossing film of all time both in the United States and worldwide. His film, the David Dobkin-directed dramedy The Judge, a project co-produced by his production company Team Downey, was the opening film at the Toronto International Film Festival in 2014. Downey played Tony Stark again in Iron Man 3 (2013), Avengers: Age of Ultron (2015), Captain America: Civil War (2016), Spider-Man: Homecoming (2017), Avengers: Infinity War (2018), and Avengers: Endgame (2019). Downey is scheduled to star in an upcoming Pinocchio film and The Voyage of Doctor Dolittle. Downey will reprise his role as Holmes in a third film, scheduled for release on December 25, 2020. ^ a b c Friedman, Roger (October 14, 2003). 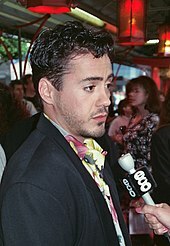 "Mel Gibson's New 'Passion' Is Robert Downey Jr". Fox News Channel. Archived from the original on April 24, 2008. Retrieved May 11, 2008. Awards for Robert Downey Jr.